Looking for "low low prices" and want to stop in and say "Hello?" No problem! I work at Walmart in the St. Louis area, and really like my job. 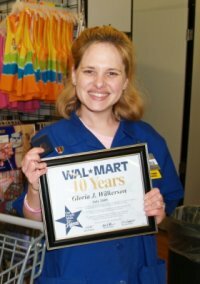 I really enjoy interacting with people, and have made many friends over the 10 (my work anniversary is July 20th, the same day as the moon landing) years that I've been working at Walmart. I work in the General Merchandise section, which focuses on putting new product on the shelves, and also putting back what you the customer leave in the wrong place. Our store recently started carrying food items (kind of like a "mini Super Walmart"), and that changeover has been pretty smooth. I also was lucky enough to be selected as a model for the Walmart advertisement papers, and on their website as well. I got to have my picture featured with some clothes that we carry, as was my husband, Mike, who was a model for pants in the Walmart ads and website. I hope to have the chance to do the modeling more, because I love clothes, and really enjoyed working with people that make advertisements. For those of you considering a job, I recommend Walmart, with just a few reservations. The managers at stores like Walmart are only there for a short time. That means if you get to liking them, it's a short-lived situation, because there will be someone else coming in that may or may not be to your liking. That also means (for me anyway) that while one management team may understand how to deal with Deaf people, the next one that comes in may not. That has happened a couple of times, and so the part about them staying for a short time has actually worked out well. The benefits are really good, and there are all kinds of extra programs, that really help compliment my husbands existing insurance. I also get discounts, and they are very regular about giving out extra coupons during the holidays for even larger purchases. It's also great to be part of a team and Walmart is one of the largest teams there is in business today. I am happy to report that I have finally been transferred to the Walmart closer to my home. It's been a long time coming but we are very thankful for the shorter trip time and increase in monthly income. If you're looking for a job, I recommend contacting Walmart. Update: Above is a picture of my on my first day at my new Walmart. I am very happy and meeting many new people (who have come to my website to visit! Hello!) and am very happy I was able to finally be transferred. 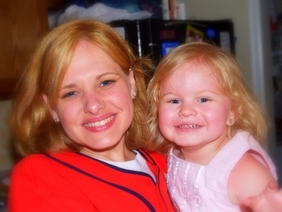 Be sure to check out the Gallery of photos for more of my family and I! We have lots of fun, and are happy to share with family members visitors and more!